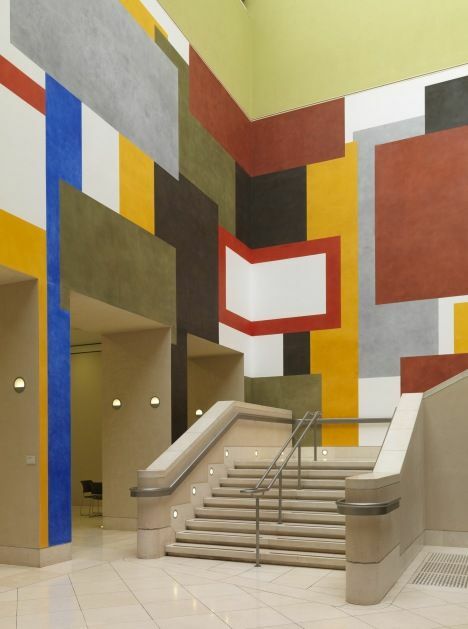 Drawing for Free Thinking is a new wall drawing for Tate Britain, designed to wrap around the Manton stairwell. Inspired by the long tradition of twentieth-century constructivism and by David Tremlett?s involvement in conceptual art in the 1970s, Drawing for Free Thinking consists of broad blocks of strong colour, straight lines, squares and rectangles. It explores floor plans and architectural features the artist has encountered at the gallery such as doorways or windows abstracted into geometric shapes. Tremlett and his team of assistants work with pastel crayons which they rub directly onto the wall with the palms of their hands.